Barry Goode, a Palace Acquire intern with the Air Force Life Cycle Management Center’s Business and Enterprise Systems Directorate, poses with the van he received with assistance from co-workers. When most people think of the word strength, it is easy to only interpret the word as a strictly physical ability. However, in the case of Barry Goode, a Palace Acquire intern with the Air Force Life Cycle Management Center’s Business and Enterprise Systems Directorate at Maxwell-Gunter Annex, Ala., there exists a quiet inner strength that allows him to shine just as much as those around him. If you spend only a few moments with him, there is a certain energy that is infectious and makes you appreciate how precious life is and how to deal with the adversities that come our way. Diagnosed before the age of five with muscular dystrophy, while also dealing with scoliosis, Goode’s disability might have been viewed by some as a hindrance in leading a normal life. 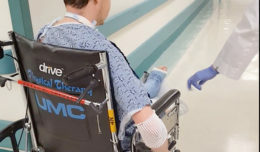 He was able to walk freely without assistance until 2010, but started using a manual wheelchair for long distance in 2011 and eventually began using one daily in 2014. In spite of this, Goode is an individual that does not view these setbacks as impediments, but rather looks at all things from an optimistic perspective. “I have a wonderful family and a great support system that stands behind me and encourages me each and every day,” Goode said. Goode’s career started with the Alabama Department of Rehabilitation Services, where he says the daily routine of getting to and from work presented him with some challenges. This would seem to be a simple solution to this problem; however, other setbacks would come with this van, which left Goode in a position where figuring out an effective mode of transportation would become paramount in his day-to-day routine. While a student at Troy University, an opportunity for an internship arose that Goode could not pass up. From there, Goode’s journey would take him to Maxwell AFB-Gunter Annex, where he became a member of the PAQ internship program, headed locally by Cedric Johnson, Training and Development Coordinator, and Marcie Rhodes, PAQ Champion. 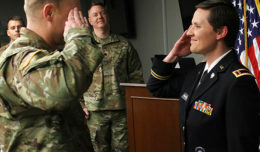 The PAQ program is a three-year development and training program, providing entry-level opportunities to qualified individuals outside of the Air Force. Goode said that Johnson has been instrumental in his professional development. Despite the career progress that Goode was making within the PAQ program, there was still the issue of how to get to work efficiently; Goode required great assistance from others upon arrival. There would be many days where Goode would have to wait on others to assist him in getting out of his car, just to go to his office to perform his daily tasks. In spite of these circumstances, Goode has always maintained a positive outlook. 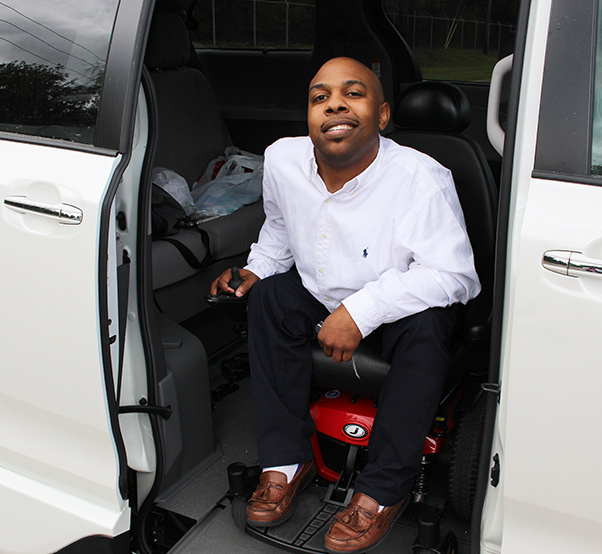 Through the assistance of co-workers, a brand new van was recently purchased for Goode that has provided all of the capabilities he needs in order to make his day and routine as normal as possible. 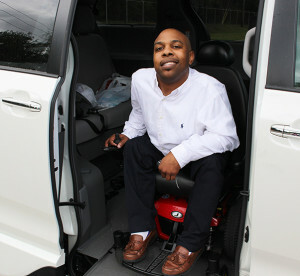 “The power chair and wheelchair accessible van has given me the ‘freedom’ I once knew years ago when I could come and go as I pleased without requiring immediate assistance for entering/exiting a vehicle and building,” Goode said. Outside of the office, Goode credits his fraternity brothers of Kappa Alpha Psi, Inc., as well as other family members for being the constant motivating force in achieving the goals he has set for himself. For those who have similar challenges in their lives, Goode offers a simple piece of advice. In the future, Goode hopes to work towards a career in financial management and inspire others who have similar predicaments.